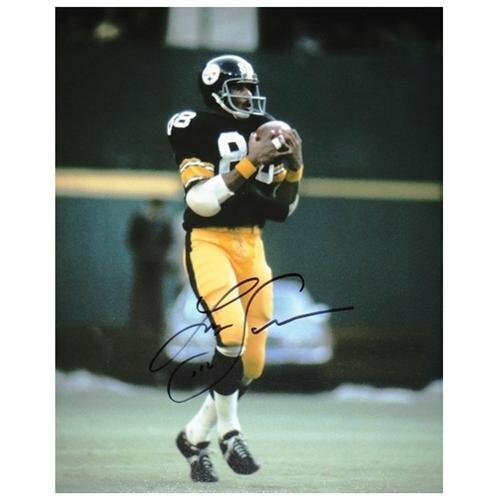 Lynn Swann football cards and autographed memorabilia will always be treasured, particularly by fans of the Pittsburgh Steelers. Winner of four Super Bowls as well as a Super Bowl MVP, Swann is remembered as a dynamic receiver with a brash confidence that ushered in a new era at the wide receiver position. Long before there was Terrell Owens, Brandon Marshall or Randy Moss, there was Lynn Swann who stepped on the field with an equally confident, yet far less cocky demeanor. A favorite weapon of the Terry Bradshaw-led Steelers of the late 1970s, Swann never shunned the media spotlight but preferred to let his play do the talking. Swann was drafted by the Steelers with the 21st overall pick in the 1974 NFL Draft. He would make his debut that same season. As was customary for the time period, his rookie card would be issued the following year, as part of the 1975 Topps Football set. He has a second card in the set as well, which is a Highlight card documenting his 577 punt return yards. 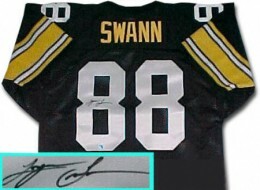 As popular a player Swann is, he has a small number of certified autograph cards in the market. His first was part of the 1992 Pro Line Portraits set. It would be 11-years before another Lynn Swann autographed card was produced. Upper Deck included him in both 2003 SP Authentic and 2003 Sweet Spot Football. His first memorabilia cards would be produced in 2004 by both Donruss/Playoff and Upper Deck. As would be expected, Lynn Swann is a frequent signer at national and regional sports collectibles conventions. 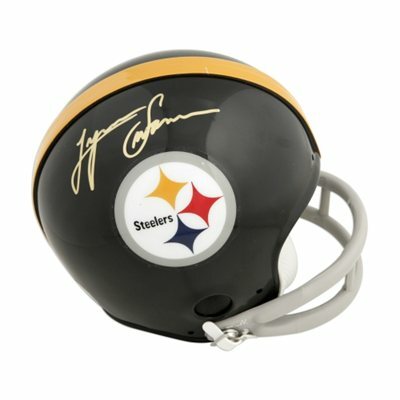 His signature is always in demand as new generations of Steelers fans learn about his remarkable on-field accomplishments. Of particular value are any items associated with his four Super Bowls, specifically multi-signed items like team footballs. 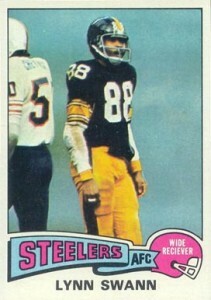 Lynn Swann's rookie card comes from a classic mid-1970s set. The white borders feature a large photograph. The colored banner and helmet stand out to display the player position, team and conference. 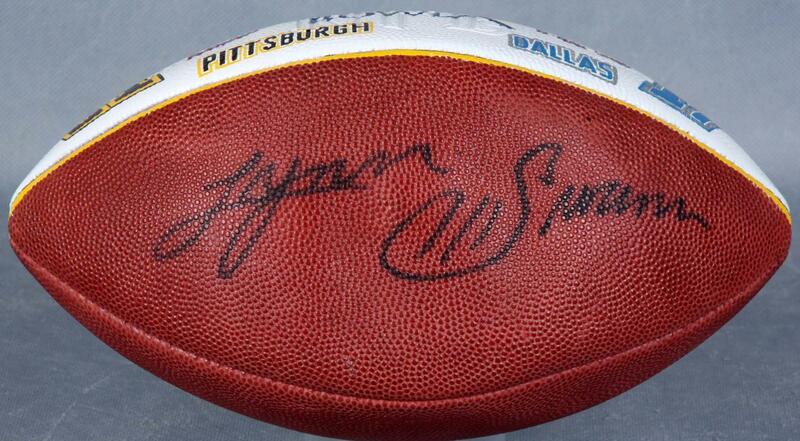 Below you will find examples of what an authentic Lynn Swann autograph looks like. This can be used as a first point of reference for determining the legitimacy of autograph memorabilia, but is not a substitute for having your items authenticated by a well-respected professional autograph authentication company. Some of the trusted sources within the sports memorabilia market include the following companies: PSA, JSA, Steiner, Tristar and Mounted Memories. Click on any of the images below to view full size photos. A distinct signature with fluid, flowing lines, but not every letter is legible. The letters "L" and "S" are oversized in comparison to the rest. The "L" has a small loop at the top start and a line that comes down on a 60 degree angle before larging a larger loop and circling back to the right with a long line that underscores the remaining letters. The pen lifts before starting the "y" which includes a shallow "u" shape and a long loop that falls well below the horizontal. A long line with a couple of shallow rises implies the "n"s.
The "s" starts with a small hook shape at the top and a large swoop at the bottom. The "w" starts within the lower swoop of the 's" the "a" is attempted with the remaining "n"'s resembling the first pair. Gary � PSA is probably your best bet. Their website is psacard.com. LYNN SWANN STEELERS 2003 SWEET SPOT SIGNATURES HELMET AUTO SNAP TIGHT #23 25 ! !